This page gives some tips for visually impaired individuals to make viewing this website more comfortable. If you have any comments or recommendations in making this website more accessible for people with disability, please e-mail us. Click on 'View', then select 'Text Size', and select 'Largest', 'Larger', 'Medium', 'Smaller' or 'Smallest'. At the bottom right of the window, there is a button with a magnifying glass. Click on the arrow, and then select the desired zoom level. Alternatively, press 'Ctrl' and '+' to increase zoom level in 10% increments; 'Ctrl' and '-' to decrease zoom level in 10% increments. 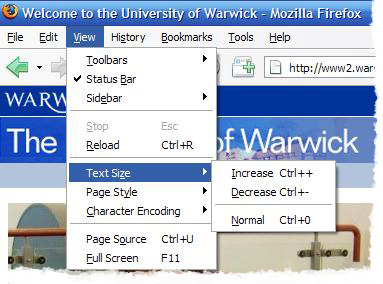 Click on 'View', then select 'Text Size', and select 'Increase' and 'Decrease'. 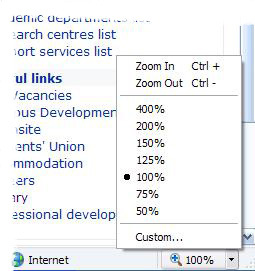 Alternatively, press 'Ctrl' and '+' to increase zoom level; 'Ctrl' and '-' to decrease zoom level. 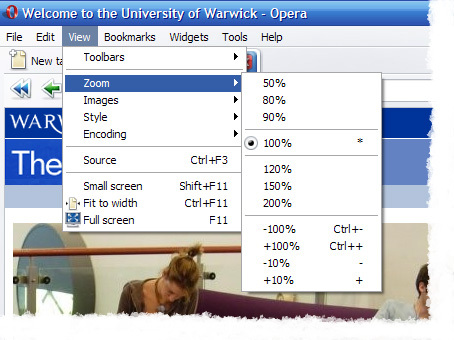 Click on 'View', then 'Zoom' and select the desired zoom level. Alternatively, five keys are designed for zooming texts: 6, 7, 8, 9, and 0. Press '0' to increase zoom level; '9' to decrease zoom level. Alternatively, press '+' and '-' on the keypad to increase and decrease respectively. Press '8' to increase zoom level; '7' to decrease zoom level. NB: To return to normal, press '6', '*' on the keypad. 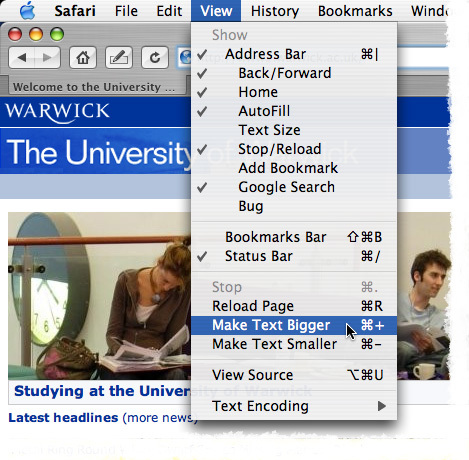 Click on 'View', then select either 'Make Text Bigger' or 'Make Text Smaller' to select the desired zoom level.